It seems that the amber signal bulb in both the OEM and this version is an incandescent instead of LED. Q: Have any of you successfully replaced it with an as-bright or brighter LED bulb, and if so with what model or type? I already have half of my lights as LED (mostly the rear ones) and want to convert as much as possible to reduce electrical draw. My front side flush mount OEM signal lights are still incandescent and I don't want to run two sets of incandescent front signal lights. All led replacement bulbs I've seen have been with SMD nodes. Didn't find what type bulbs those use. I'd probly find other mirrors with built in LED indicators if you're not dead set on getting exactly those. Peruse the evilbay for a while and you surely find something to your liking. No personal experience on replacement LED bulbs as those are illegal here but replacing the whole light to an LED type is not. Btw what is that mahoosive tail thing in the pic?! Photoshop or some kind of a rack box? Last edited by Mattson; 12-16-2014 at 03:57 PM. Thanks for reply. I've scoured eBay and Amazon and other places and, yes, there are other integrated mirror-signal lights but quality is questionable as well as brightness (cool loking but slender LED area). Figured since these where what seems to be OEM knock-offs for CBR 1000 and with bigger light area, I'd be willing to put in the DIY conversion for my CBR600. So I'll keep looking, though I may just build my own bar of amber lights parallel to the mirrors (though at a 90 degree angle to front so visibility is best). As to question on whether the thing on my bike in my avatar is just Photoshopped, that pic was an in-progress facsimile of what was at that time still without reflective and other stripping -- below is a few pics of what it actually is from this summer. Since I live on limited disability income since 1993, I can't afford a car, so this is my trunk system built from scratch. Too complicated to 'splain how I did it but it did take me a while to pull it off. At the back of it I have 2x48 red LED built in - one row on all the time, second comes on on brake). Below those were/are 2x 10 mm dome amber LED which I since disconnected for I've added 2 6" oval truck-trailer sequential (6 arrows turn on direction of turn) signal lights underneath. So, no, t'aint pixeled in fake. It's my CBR to micro pickup truck conversion - lol. 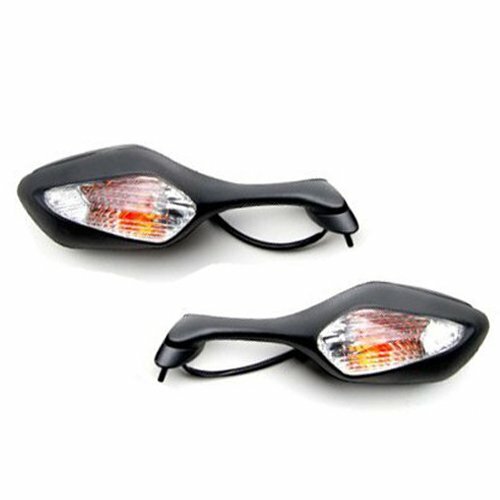 Quick Reply: Mirrors w/Signal-Running Lights: LED Bulb Replacement?